After Wahj graciously drove the cats and I over to the new flat during rush-hour traffic, I spent a little time getting them settled and watching them pace from one room to another. Then I left them to it and headed to my nearest HDB town central. What I needed were essentials like toilet cleaner and breakfast food. 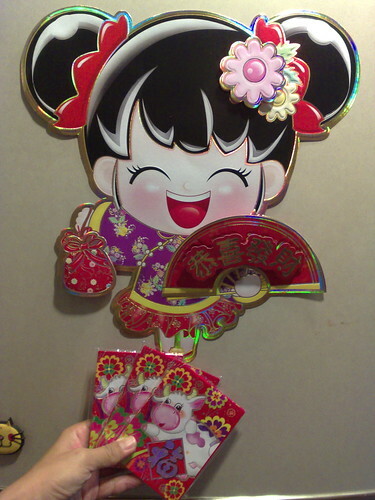 What I ended up getting as well --- because what's the point of pottering around "the heartlands" if you don't make the most of it ---was some Chinese New Year decor and gloriously tacky ang pows to hand out to the kidlets. I think I'm going back for the red-and-gold hanging lanterns and fu (luck) signs.